Last night I met Ike, the former president, in a dream. He was elderly but virile, strong, handsome, forthright. He told me a story that occasionally was interrupted by people walking thru and making comments. Nobody but me noticed who he was. He and I were also working on something, like clearing out a garden. I wanted to tell him I’d just met or dreamt about FDR, who like him seemed to be well preserved. In another dream I rode a train to Michigan, an unusual sort of train with doors and windows that opened simultaneously. Many passengers got off at a certain station in Michigan, maybe Ann Arbor—no sign of Ann Arbor Anne. And in the climactic dream it was winter, I was outside photographing with others. Water was the theme. I grumbled about how difficult wearing heavy clothes made photographing. Nearby two thin plastic strands descended from high above, and on each strand men dangled. They were like window cleaners but there was no building with windows to be cleaned. While photographing I noticed that my lens, the normal, had clouded up. I couldn’t clean it. This frustrated me and I thought it would ruin any photos I’d make. Before I left the Beit Shean guesthouse and after I’d exploited the renewed and solid internet connection thru the café—I could have sat there all day doing my web work—I re-explored the Roman ruins, going into rooms, sitting on benches, noticing how different the light was from the evening before. I drove into the second Roman ruins site, the national park, but decided I’d had enough of this topic. “Down in the valley” for sure. 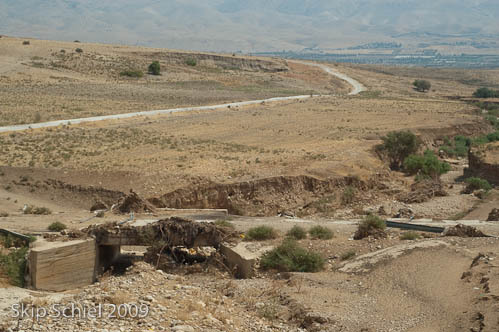 From Beit Shean to Jericho means tracing more of the vanishing Jordan River: wadis that might carry water in a good wet season to the Jordan but now look eternally dry, pipes and pools whose missions are a mystery to me, extensive fields heavily irrigated, rolling dry hills, and hot air, not as humid as I’d expected. The scene reminds me of several places in the United States I’ve visited: South Dakota and especially the Bad Lands. Lands in this region, in places, are truly bad, in the sense of barren and tortured. I hope a few of my photos show this. Also California, those heaving brown hills near the San Francisco Bay area. And maybe Wyoming with the abandoned buildings, endless roads, hills and valleys. A ghost town-like appearance. Fences. Large long winding fences, some marked “electrical fence” which means motion detecting, not electrified. Sometimes 2 sets of fences. What is inside? 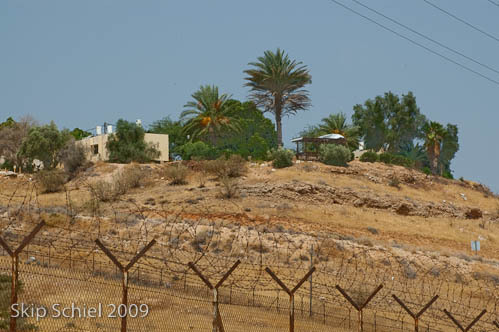 Probably lands confiscated from Palestinians by Israeli Jews. I tried entering the settlements in this region which are fenced and gated, but decided not even to ask. One route to a bridge (as shown on the map, maybe not in reality) was also behind a fence. So my contact with the river, if there was a river to be contacted, was zero. I’d seen this region in 2003, from the air as I flew home from my first foray into this topic. And then a second time with the Steps of the Magi alternative tour, busing thru here to Jerusalem. But this time was as if the first time because I could stop at my leisure to explore more fully. I’ve mentioned that this travel mode reminds me of other trips, I’ll list some: South Africa with Y and South Africa with Tom when we rented cars; New Orleans to Chicago during my off period from the Middle Passage Pilgrimage when I drove the pagoda car along the Mississippi River to explore that region in the winter of 1998; the Great Plains excursion of 1982 when I used the family car to penetrate the mid land thought to be too flat for photography and I discovered more of the history of our continent—American Indians and a new theme for my work; and several trips I made in my pickup truck, Cimarron, especially west to Colorado in the summer of 1961 or 62. That trip was probably the first of this series of car explorations to photograph. I’ve had 40 plus years to develop my methodology. Finally arriving in Jericho, after wondering where I’d land for the day, I quickly found housing at the Sami Youth Hostel. Luckily it was heavily advertised along the entrance road, clearly marked so I could find it. When I first saw a sign I stopped to phone, making sure it existed—a “youth hostel” in Jericho?—and then the price and finally the location. I seem to the only resident. I asked, when is your busy season? not wanting to embarrass the young man with the husky voice who seemed to be the manager. It’s Ramadan, he explained, and everyone stays at home. Which doesn’t explain why others like myself not observing Ramadan might not be here. I think summer heat is the answer. 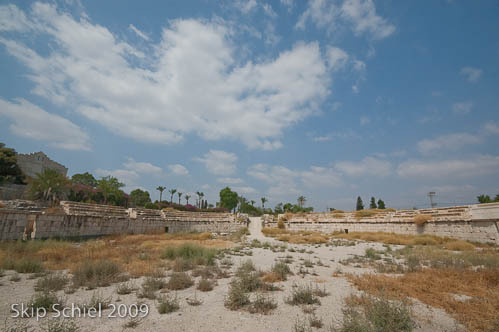 This place might be stuffed with residents in the winter when people flock to Jericho for its warm winter weather. The room is air conditioned, the electricity so far has not gone off, I avoid mid day heat outside—altho I tried a walk yesterday around 4 pm just to be outside and sample the weather, I retreated to the room after an hour’s walking—and all this for a mere 100 shekels (mere compared with the prices of some previous overnight spots). Jericho sprawls. 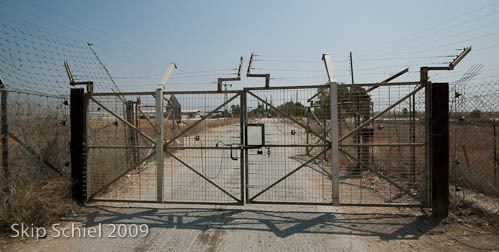 And entrances are often blocked by Israel. The ditches remain, those ditches that I first encountered in 2003 when our delegation attempted passages thru the 2 checkpoints, denied at both. So we parked our bus behind palm trees and scurried across the ditches to meet a representative of the PLO. On this attempt to enter Jericho the first road I tried in the north of town, clearly marked Jericho, had a roadblock. The second brought me to a checkpoint and the soldier wouldn’t allow entrance, even after I flashed my USA passport. Noticing a busload of Palestinians behind me heading for the same checkpoint I assume this is passage for residents of Jericho. He directed me, right and right and right again. And this finally brought me to an entry road, the main road, with one Palestinian waving me thru, greeting me with welcome to Jericho. Driving past the International Hotel where the Palestinian section of the Steps of the Magi walk began in 2004, I swiftly found the Sami Guesthouse. 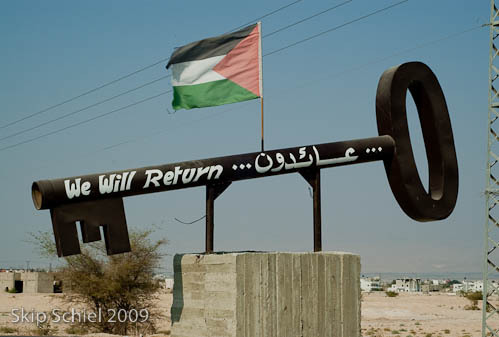 The new reality of Palestine slowly seeped into me as I drove south. First a checkpoint just south of Beit Shean, not stopped, reminded me that I was leaving Israel for the West Bank, nominally the West Bank, nominally Palestine. However, the abundance of settlements suggests something else—more infiltration of Jewish Israelis, more land theft, and this among the most arable lands in the region. 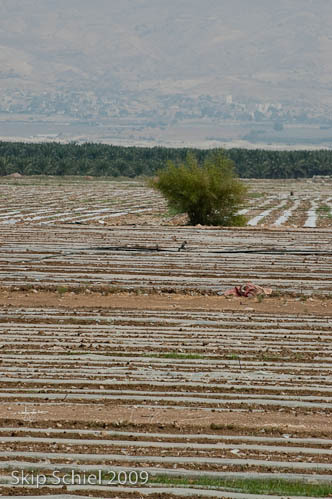 Huge groves of date palms and banana trees, other fruit and olive trees, cultivated fields with brown slash on them, pipes, valves, and ponds, all this suggests Jews are here to stay. 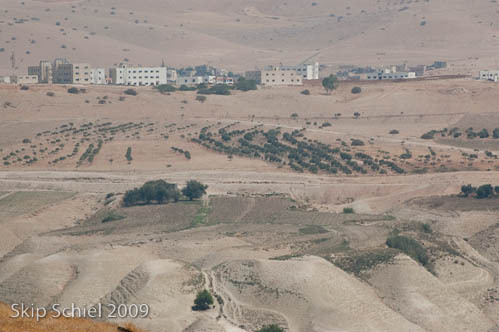 Because of the relative inaccessibility of this part of the West Bank I believe few visitors ever see it, and thus are not aware of another manifestation of the settlement movement. We could classify the settlements into at least 4 categories: the best known settlements of the West Bank mountain spine from Jenin to Hebron, East Jerusalem and its “neighborhoods” like French Hill that do not resemble conventional settlements, the kibbutzim in the Galilee and Golan that I’ve recently visited, and now the settlements, colonies, illegally stolen lands of the river valley. There may be other types as well, related to Bedouins and the Negev, but I have no experience with these. My final days’ plan is finally taking clearer shape. I’ve decided not to visit Ofer and his wife who live in or near Modi’in, meeting him thru Couch Surfers, because I realized yesterday when studying the map that he is on the other side of Jerusalem, requiring a long drive. 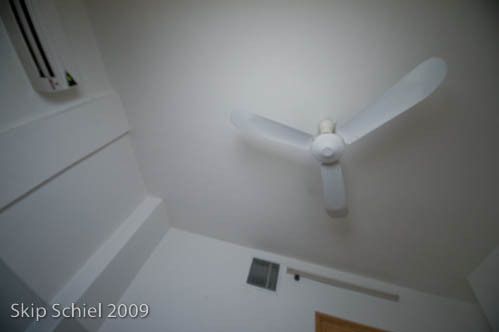 So tonight I will reside in the Palm Hostel in East Jerusalem, one of my favorite spots for sleeping. Before that I’ll drop off the car in Wes Jerusalem at Avis office (braving Jerusalem traffic and drivers). After first leaving my large heavy black plastic hard cased ailing wheeled luggage at the Palm. Then to Ramallah for 2 days at the ISM media office, backing up files, getting my hair cut, paying for the final month of rent at the school, picking up my stored stuff from the school, saying byes, etc. And finally the old city of Jerusalem, residing at the Austrian Hospice for my final 2 days, departing early for the airport on Sunday. All god willing, inshallah. 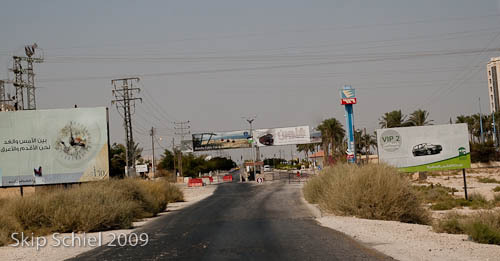 Returning to the theme of Palestinian reality, first the checkpoint, then the sharp contrast between Israeli and Palestinian areas along Rt 90, the main road thru here. I’d been wearing my white t-shirt with the Hebrew lettering, slowly growing aware that this might not be appropriate for some of these regions. At a rest stop where I ate lunch with about 30 Israeli soldiers, that t-shirt fit right in. I changed it before entering Jericho, back to my yellow Quaker Fellowship of the Arts t-shirt. Next, the issue of Ramadan, people are fasting all day, even in this hot area. When yesterday in Jericho I mistakenly opened a door to what I thought might be the Internet café, I woke a man slumbering on a couch in a barbershop. Remaining indoors and maybe sleeping are ways to grapple with the Ramadan fast. What about my shorts? Manager said, not a problem. Maybe because of the presence of tourists in Jericho. I refrain from drinking or eating in public during the daylight hours. Also Palestine is now on winter time, one hour later than Israel summer time which changes in a month of so. And I say shukron not toda for thank you and greet people with marhaba or salaam elekum not shalom. 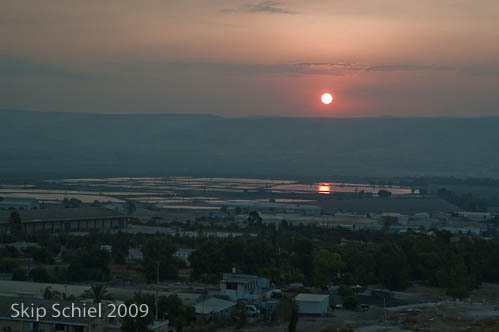 I’m noticed more in Jericho than anywhere in Israel. The kids again, keefalek, how are you? Drag out the old mubsut and montaz, happy and excellent. A minor adventure last evening. I was hungry, I trusted my stomach, I wished to dine at the elegant restaurant near the terminal of the cable car which runs up the Mount of Temptation. Not sure how to find it, carrying a map from the guidebook, I set off at dusk, hoping not only for food but for photos. No photos, eventually food. Lost but aiming at the mountain, circling around, I found the place, just in time as they were closing. Without rushing I wolfed down roast chicken and rice, pickles and olives, flat bread. And was served the traditional Ramadan pancake sweet as a bonus, no charge. All for 50 shekels plus tip, a bargain. I met the owner, a jovial character speaking excellent English. 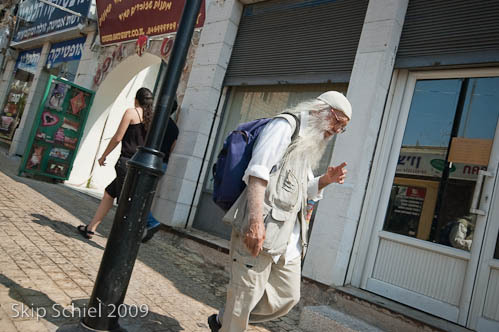 He told me business is good, come back tomorrow for the open buffet, 60 shekels for all you can eat, starts at 11. I might try it. He also told me the restaurant had two wireless networks I could use, sitting in my car since they were about to close. Another man helped me access with the codes, I connected, we chatted while I sat in the car showing him and another man leaning over him my most recent blog entries, stopping at the image of Raghda, wondering how they perceived her. 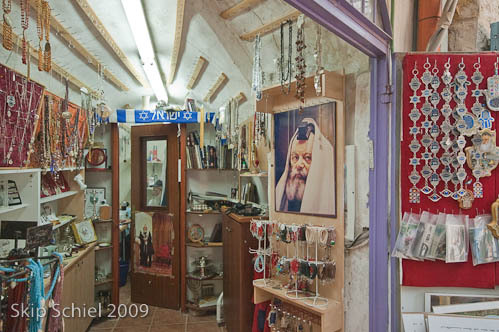 The man explained that he was from Tubas in the northern West Bank, taught computer use in Jericho, also managed the computer network at the restaurant and tourist shop and did the accounting. Like many he was impressed that I’d been in Gaza, really, one month? We discussed all those who’d like to emigrate from Gaza. And you, I asked, what would you like to do? No clear answer. He explained to me that leaving Palestine required one be older than 45, married, and have children, if I understood him correctly. The Internet connection soon faded, as it often does, so I did little. But may try again this morning. Now one question remained: would I be able to find my way to the guesthouse in the dark? Happily I did. Then a strange feeling came over me last night as I sat alone in this lonely hostel: eroticism. Was this temptation anything like the temptation of Christ? Is there some earth force in Jericho that affects human beings? We are at the lowest point on earth, 260 m below sea level, in an earthquake zone. I’ll check my feelings throughout my stay in Jericho.